Hidden in Sikatuna Village in Quezon City is a new private dining gem, Chef Tatung’s. The story of Chef Tatung’s started from Chef Myke Sarthou inviting friends to dine in his humble home in Sikatuna Village. Due to the irresistibly good food served by Chef Myke, who is better known to his friends as Chef Tatung, friends started to invite their own friends. Everything just lead to a domino effect that eventually became the Chef Tatung’s today. At first, the restaurant is only open every Fridays. 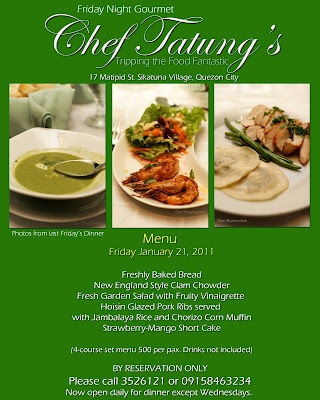 As people kept coming, Chef Tatung finally decided to open his restaurant everyday (except Wednesday) this 2011 (Hurraaay!). The restaurant is Chef Tatung’s own abode so expect a homey atmosphere. As it is dimly lit, the feel of the restaurant is somewhat intimate and since it’s located in a village, the mood is peaceful and laid-back. This is the menu on our week of visit. 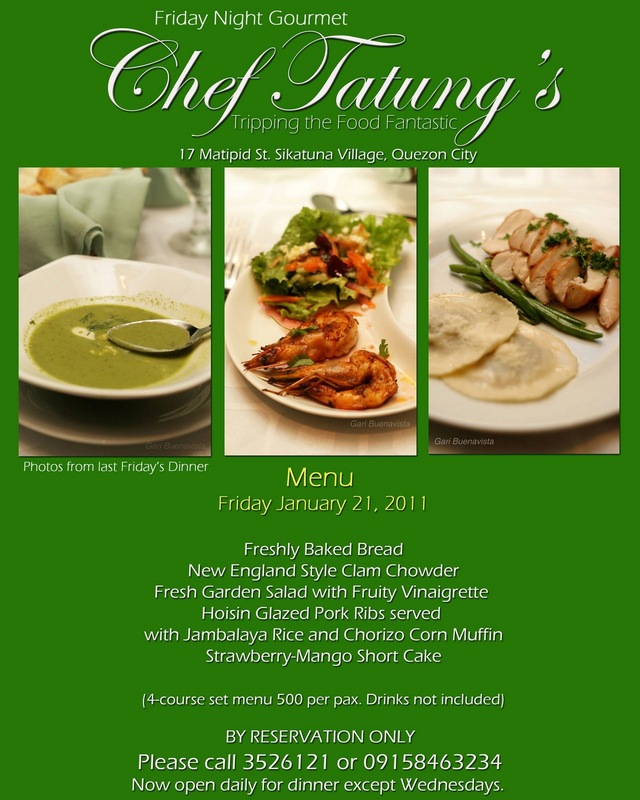 Chef Tatung’s serves 4-course dinner for only PHP 500.00. That’s a bargain. But wait ‘til you hear more. Only organic food is served in the restaurant, which some are from Chef Tatung’s own backyard. Also menu changes every week. So before you call for a reservation, check if their menu suits your preferences. Freshly Baked Bread with butter. The multigrain bread is light. Perfect for dipping in the first course of the night: the soup. New England Style Clam Chowder. I only tasted the butter and the broth in the soup. Although the clam is missing, the amount of organic veggies made up for it. The Main Course for the night is the Hoisin Glazed Pork Ribs but you can request for another main course as a special request. The special requests can be a seafood dish or a vegetarian option. Hoisin Glazed Pork Ribs served with Jambalaya Rice and Chorizo Corn Muffin. The Pork Ribs are soft with the right amount of sweetness to it. The Jambalaya Rice is creamy and heavy on the meal. Both are good except for the Corn Muffin which is a little dry. Sesame-Crusted Fish Fillet with Soy Sauce served with Jambalaya Rice and Chorizo Corn Muffin. It’s covered in crunchy sesame seeds which bring out the overall taste of the fish. 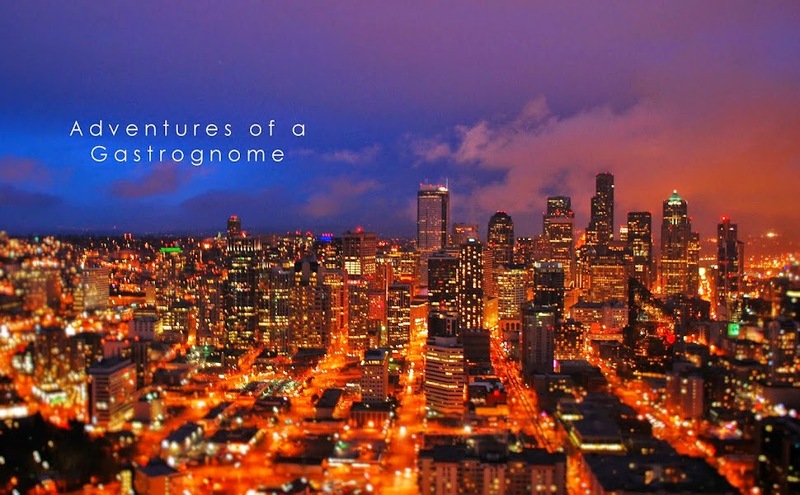 The portion is small but definitely unforgettable. Grilled Vegetable Fettuccine. The aroma of the grilled vegetables is really mesmerizing. As soon as it was brought to the table, all of us stopped what we were doing just to feast on it. A few of my friends even wanted to exchange their main dish with my pasta. Now, if the pasta smelled good, well, it tastes even better. My next trip to Chef Tatung’s, I’ll definitely order another vegetarian option. 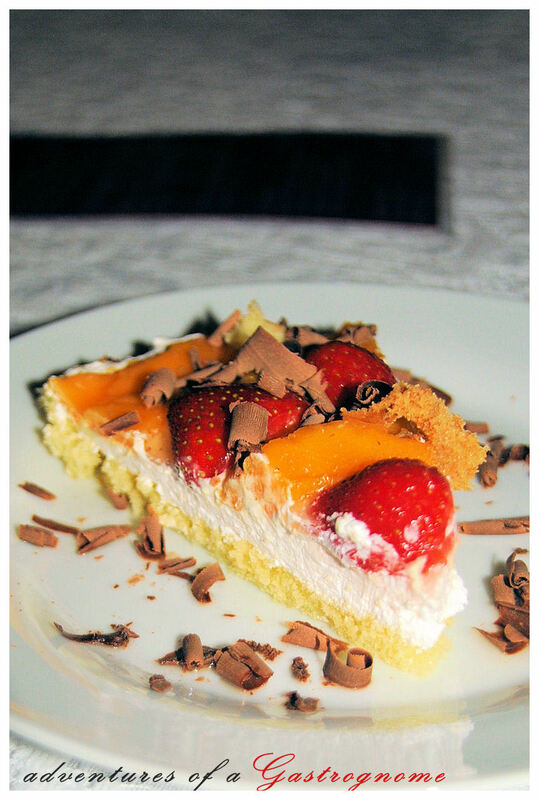 Strawberry-Mango Short Cake. I love the shortcake. The strawberry is sweet, and so is the mango. The cake is soft and light and the whipped cream is just perfect. Clockwise: Carrot Juice, Strawberry Shake, Shirley Temple (non-alcoholic) and Strawberry Margarita. Drinks. Drinks at Chef Tatung's ranges from fruit and vegetables shakes, juices, softdrinks and alcoholic beverages. 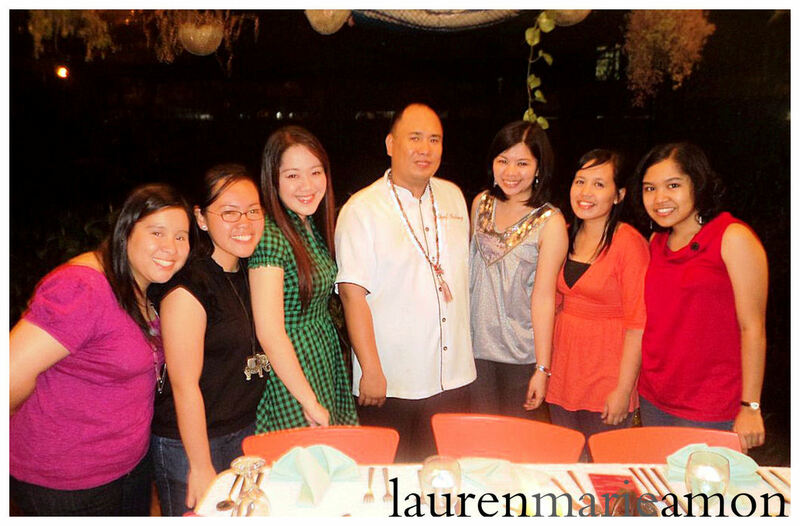 Kae, Lara, Lauren, Chef Tatung, Me, Donna and Micha. From freshly baked bread and organic salads, local ingredients used to make delightful courses, and of course, the yummy dessert, Chef Tatung’s is simply incredible. 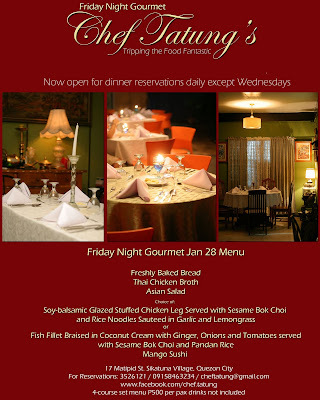 For more info or for menu of the week, check Chef Tatung’s Facebook Page.